(NewsUSA) - Sponsored News - Overall, close to 20 million women are affected by infertility. With a 58 percent reduction in sperm counts since 1938 due to estrogen-mimickers in many over-the-counter medications and in the water supply, men are equally affected. But 35 years after the first "test tube baby" was born, many couples struggling to conceive naturally are unaware of infertility treatment options that are available before they undergo the costly, invasive and, for many, humbling commitment to in vitro fertilization (IVF). Between the expense -- a single IVF cycle costs $12,500 on average, according to the American Society for Reproductive Medicine -- and the lack of medically approved alternatives, millions of would-be mothers and fathers feel stuck without an intermediate solution. retailers including Wal-Mart, Rite Aid and Walgreens. In fact, 60 percent of insured individuals in the U.S. already have reimbursable access to it through their pharma benefits like Express Scripts and Caremark. Additionally, religious leaders -- including the National Catholic Bioethics Center; Focus on the Family; and A TIME, the international Jewish organization -- have determined that this approach fits within their teachings as a first step to conception. 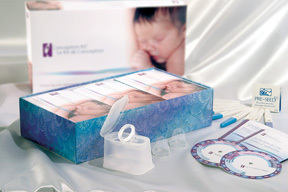 The use of a uniquely designed Conception Cap, which is manufactured with medical-grade silicone, concentrates the sperm at the cervix's opening for 4 to 6 hours to enable greater fertilization opportunity, and it allows the user to go about her regular activities. The FDA required clinical trials on cap placement and instructions by patients. During the trials, 24 percent of the patients got pregnant during the first 30 days. This group has failed other methods used for conception, such as IVF and IUI. As more single women and non-traditional couples look to have children, along with still-staggering infertility rates and payers (insurance companies and benefit managers) keeping a close eye on the bottom line, the range of choices continues to grow for those who want to start a family. A new hope for couples dealing with infertility.